This luxury 3 bedroom penthouse apartment is situated at Laguna Beach, a beautifully landscaped complex with excellent facilities, situated approximately 200 metres from the beach. 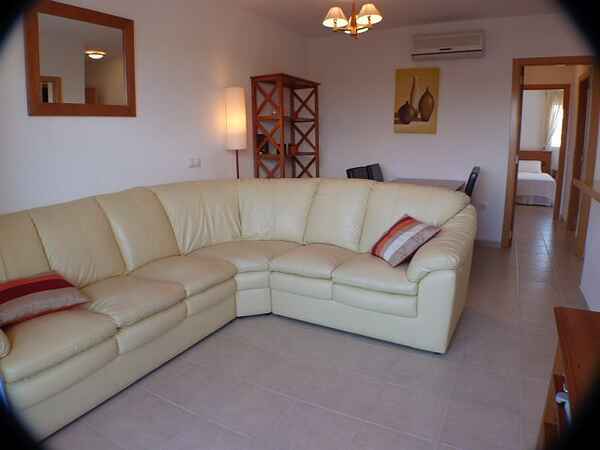 The apartment consists of a spacious lounge with wrap around sofa, dining table and 4 chairs, there is a TV with satellite free to view channels and DVD player. Patio doors lead from the lounge onto a private glass fronted terrace with views over the complex to the sea. The terrace has patio furniture for al fresco dining or to just sit with a glass of wine and relax. From this terrace, stairs lead up to a private roof terrace with built in barbecue and sink, patio furniture and loungers for topping up the tan. There is a double bedroom with en suite shower room and a twin bedroom, this comfortably sleeps four adults. The main bathroom consists of bath with shower, toilet, vanity unit and bidet. There is also a fully fitted kitchen with ceramic hob and oven, fridge freezer, washing machine and microwave. The apartment is fully air conditioned, with heating for the cooler months and includes everything you need for your stay. If you are looking for a relaxing holiday with family or friends, then this is the ideal place with the site facilities available for anyone wanting something a little more energetic. The apartment is non-smoking but you may smoke on the terrace if you wish. All bed linen and towels are included (except beach towels) and all site facilities are included in the rental price. Private underground parking is included. Private roof terrace with barbecue and patio furniture for al fresco dining and loungers for sunbathing.